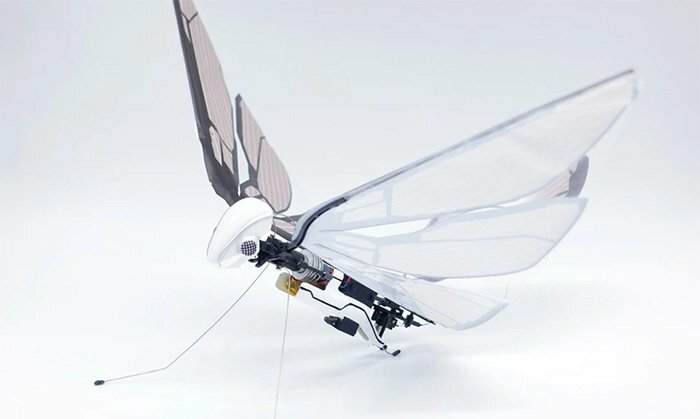 MetaFly is a biomimetic remote controlled creature designed to mimic the natural movement of birds or flying insects. There is a unique excitement that comes with having the ability to fly something. It’s an experience every human craves and it explains why there are so many toy drones out there. If you’ve ever flown, you would understand the great feeling that comes with it, and of course, the craving for more. MetaFly promises to be the next level you’ve been craving. The device is specially designed to fly like winged animals do, giving it the ability to maneuver just like them. We can bet this is the best flying experience yet. MetaFly flies using a unique method known as biomimetics. This denotes synthetic methods that mimic natural processes. The synthetic wings of MetaFly are designed to mimic the natural movement of birds or flying insects, allowing it to swirl around the house without hitting anything. Just like birds, MetaFly can take turns, fly slow, or fast and maneuver around objects. It is also capable of gliding movements towards the left or right directions. This makes MetaFly one of the few RC flying objects that are capable of actually flying in small spaces. MetaFly boasts a perfect blend of speed and maneuverability, the two most important features in any flying object. If you wish to harness any of these abilities to your advantage, a simple change in the direction of the tail would give you what you need. When the tail is down, MetaFly can fly faster. On the other hand, the flight is much more controllable when the tail is up. These modes could prove useful for outdoor and indoor flying respectively. The remote control is optimally designed for further range, zero interference, and maximum control. With this awesome technology, you can fly MetaFly superfast towards trees and other objects and then maneuver between them. With MetaFly, you do not have to worry about crashing or potential damage upon impact at high speeds. MetaFly comes with elastic wings and legs, in addition to both front and back bumpers that protect its body. Rest assured, crashing and high-speed impacts won’t do much harm to your cool flying toy. With a wireless range of 100 meters or 328 feet, MetaFly has an almost limitless ability to go the distance. It has a maximum speed of 18 km/h. At full charge, it can fly for an astonishing 8 minutes. Better still, you could even increase the flight time by charging MetaFly via the custom-built power bank while out flying. MetaFly is currently at the crowdfunding stage and the response has been amazing. With about 40 days remaining, MetaFly has already received close to 10 times its funding goal. You can visit their campaign page to get a MetaFly for yourself. Next articleVortex Bladeless Wind Energy: Future of wind turbines?